The most cosmopolitan of New Zealand’s cities, one fifth of Auckland’s one million inhabitants are of Polynesian descent. A fusion of traditions produces a vibrant urban culture that is both easy going and sophisticated. With a lively calendar of events and a year full of festivals, Auckland’s people love life and celebration. Known as the ‘City of Sails’, all things nautical feature prominently and the city now has its own America’s Cup Villagesituated in recently redeveloped viaduct basin. Auckland’s bustling shopping district, chic waterfront bars and restaurants combine with the city’s sights, the Auckland Museum with its impressive collection of Maori artefacts, Kelly Tarlton’s Antarctic Encounter and Underwater World, the Harbour Bridge and the distinctive Sky Tower, which offers inspiring views of the city and its stunning surrounds. 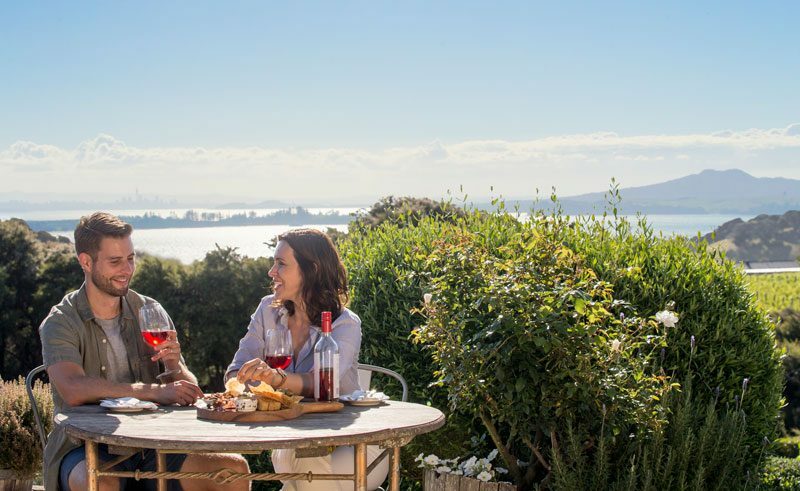 Around the city you can visit world-class wineries, hike the quiet forest trails of the Waitakere Ranges, or relax on the unspoiled islands of Waiheke and Rangitoto in the Hauraki Gulf whose glorious beaches, cafes and craft shops are just a short ferry ride away. A little further afield, are the historic Bay of Islands and Rotorua, New Zealand’s best known geothermal area and centre for Maori culture. North and west of Auckland are the Kumeu and Henderson wine producing centres where New Zealand’s enviable reputation for quality wines has its roots. Several major wineries can be visited. Southeast of Auckland, the low-lying Hunua Ranges protect a stretch of coast that attracts many thousands of migrating shorebirds. Inland, the Clevedon Valley’s polo club and golf courses attest to the New Zealander’s fondness for recreation. The forested hills ranged to the north west of Auckland are a world away, yet in the city’s back yard. Walkers can explore superb native bush, which clears at intervals to reveal tantalising views of the distant coastal bays and beaches. Choose from short nature walks through to wilderness backpacking trails. The informative Arataki Visitor Centre is a great introduction to the wilder side of New Zealand. For pounding surf and scorching black volcanic sand, head for the west coast of Auckland. At Muriwai, where a colony of gannets nests just offshore, the beach stretches for 45 wild and windswept kilometres. The Hauraki Gulf, east of Auckland, is the city’s weekend playground. In Maori, the name means ‘north wind’, yet these waters are sheltered and ideal for sailing. Fortunately for visitors, its unspoiled islands are readily accessed by scheduled boat services as well. The islands can be visited on day trips, using Auckland as a base, though the larger ones could easily tempt you for longer. Shapely Rangitoto’s volcanic cone dominates the horizon. An island of sombre black basalt, uninhabited Rangitoto emerged in a submarine eruption just 600 years ago. Its slopes support the largest remaining forest of native Pohutukawa, a tree noted for its beautiful red flowers, while the summit offers a superb 360° view of the Gulf. The gentle landscapes, cosy cafes and quirky accommodation of this beautiful island are perfect for a day visit or a longer relaxing stay. A string of glorious beaches lines Waiheke’s north shore, where some excellent snorkelling can be experienced. Inland, vineyards extend over its hilly terrain and wine tasting is popular with visitors. The pretty villages have attracted artists and craftspeople, and as the island is just 30 minutes from Auckland, people even commute to the city. One of the few places in New Zealand where the native birdlife is preserved and flourishes in the absence of predators, the island of Tiritiri Matangi is a bird sanctuary and conservation success story. Visitors can wander freely with a good chance of observing rare birds like the Takahe, saddleback and stitchbird. The largest of the islands, Great Barrier is only a 30 minutes flight or two hour ferry ride from Auckland, yet belongs to another world. There are no towns or villages and the largely self-sufficient inhabitants live without mains water or power. The distinctive lodges are a comfortable base for exploring the natural attractions of the island, which include secluded coves, surf beaches, forest walks and endless peace and quiet. For those with limited time Auckland is a wise choice for a short stay, not only for the range of accommodation and excursions on offer, but because the major sites of the Bay of Islands and Rotorua can be visited in a day trip from the city. A 30-minute flight by light plane will carry you over the sparkling waters of the Hauraki Gulf and to the majestic Great Barrier Island (known locally as simply 'The Barrier'). 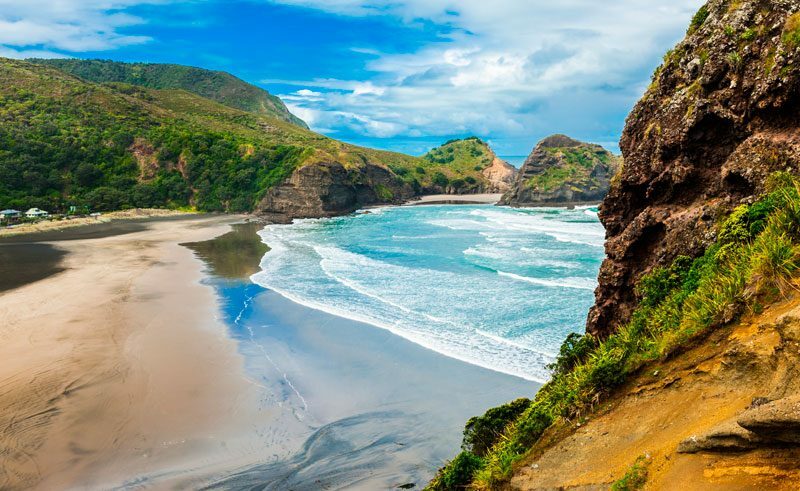 This premier, award winning eco tour takes you to Auckland’s neighbouring Waitakere Ranges to explore the scenic delights of this part of under-discovered New Zealand. Aboard this 4WD tour, you will head into New Zealand's fiery past, to learn all about the power of the Rangitoto Volcanic Island. 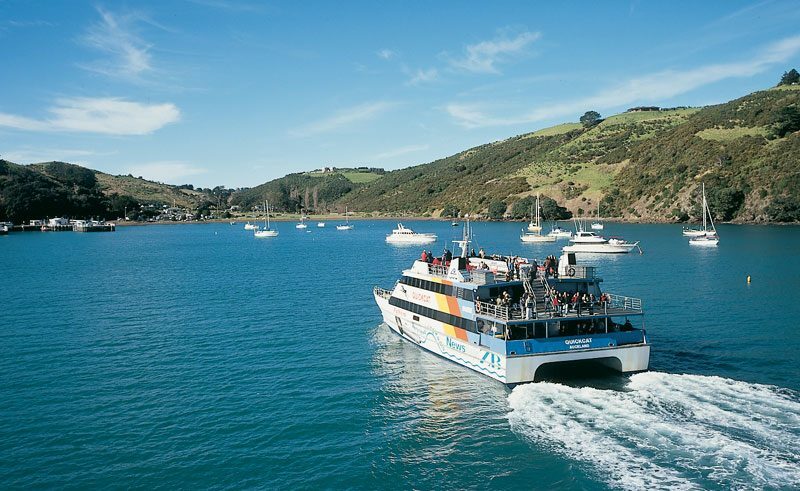 Travel aboard a luxury 20m high speed catamaran out into the Hauraki Gulf in search of the resident sea birds, whales and dolphins that call these waters home. Auckland is set on 48 dormant volcano cones and between two harbours, the sparkling Waitemata and the brooding Manukau. Known as the City of Sails, it is New Zealand's largest and busiest city. 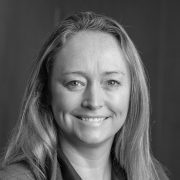 On arrival at Cotswold Cottage your hosts, Adrienne and Garth, will ensure your stay is both memorable and enjoyable. Found just a couple of minutes from Auckland's busy airport, this brand new hotel includes 153 rooms for guests who need a convenient place to stay for their late-night or early-morning flight. This beautifully restored Victorian villa features only 7 rooms located on the North Shore waterfront in the heart of Devonport. Sophisticated and restful, the 5-star Skycity Grand Hotel offers 312 rooms alongside a range of facilities and services unparalleled in Auckland. One of New Zealand's most popular hotels, the 325 room Skycity Hotel offers a wonderful place to relax and unwind in the heart of Auckland. Offering luxury accommodation in the relaxed setting of Waiheke Island, this property offers 5 suites just 35 minutes by ferry from the city. Found in central Auckland, this modern hotel has 110 recently refurbished and spacious rooms in an excellent luxury venue.